With billions of people all over the world, there are also many different languages we use to communicate with one another. In fact, there are over 6,500 of them. With so many different languages and dialects out there, it’s impossible to know each and every one of them. Even the most brilliant of polyglots can’t possibly learn all of them. So it’s no wonder that things often get lost in translation. The differences between people from different parts of the world is what makes traveling so appealing – it’s discovering a whole new culture different than ours. It’s one of the reasons why tourism is one of the biggest, and most lucrative, industries in the world. And with tourism being such a huge industry, it’s only logical that owners of businesses like store and restaurants would want to appeal to tourists and draw them in. Since it’s less likely for tourists to know the languages spoken in the country, they can increase their chances by using English – one of the most spoken languages in the world. It’s often used to address tourists, as sort of a common ground. But as it turns out, translating things to English, when you don’t know English well enough (or not at all), can result in some hilarious mistakes. From street signs to restaurant menus, and even tattoos – these translations went horribly wrong somewhere along the way. Some of them make no sense at all, others are just plain ridiculous. But they all prove that communicating in a different language is hard. Here are some of the funniest lost in translation fails we’ve ever seen, that might just make your day. It can be hard when you don’t know English and you have a business you want to advertise in the universal language. You might try to come up with creative ways to translate things, like using the internet. There are so many websites and apps today that help you translate texts in all sorts of languages, so why not use these to help your business take off with the tourists? Well, apparently there is a very good reason why you shouldn’t do this. 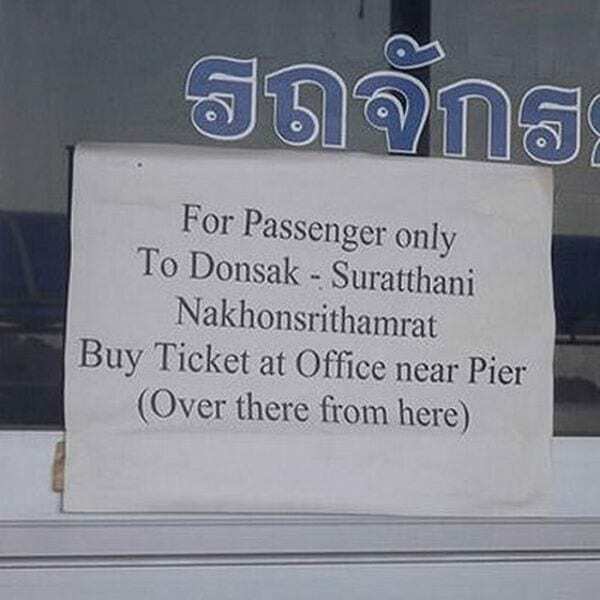 If you don’t know English at all, you might end up with a sign like this. This poor business owner had no idea that he received an error – they just used it to name their place. This is one of those signs, which makes great sense as it starts off, and then goes completely haywire. Good rooms for a cheap price is something that might appeal to many tourists, but that’s where this sign gets a little weird – to say the least. These people claim to have three or four human lives – as many human lives as you want, actually! Unfortunately, this translation not only fails to make sense, but also probably succeeds in creeping tourists out and scaring them away. And we can’t blame them if they chose to go with a different hotel. 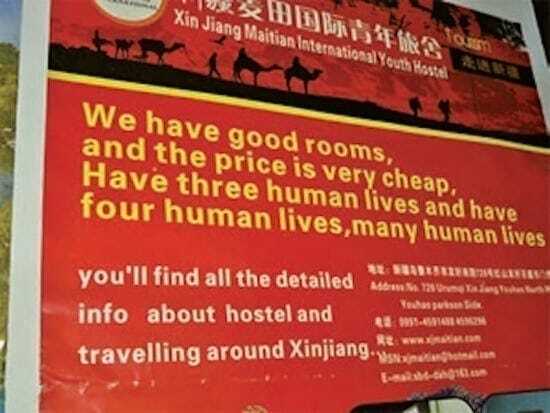 We know we wouldn’t check into a hostel with many human lives, either. We honestly don’t even know what this sign is for (although our best guess would probably be corn). Either way, if we came across this sign while traveling somewhere, we would definitely stop to see what all the fuss is about. 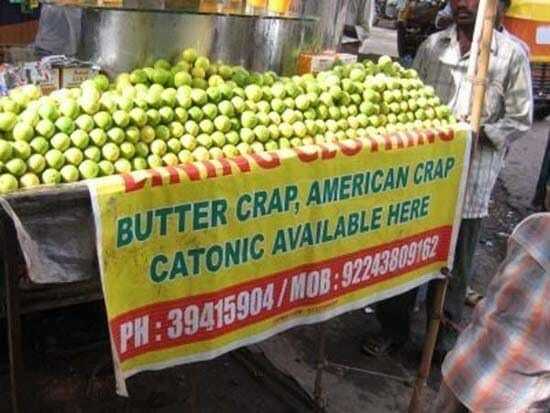 It might not look very appealing at first glance, but when you stop to think about it – if it’s American and has butter on it, how bad could it really be? We’re already hungry. Things can get very confusing for tourists, traveling in a strange country with a foreign language. That’s why it’s important to have signs with helpful directions in English, so that tourists can easily find their way and not get lost. Take this sign, for example. It clearly states that whoever wants to buy a ticket should go somewhere that’s over there from here. We wouldn’t be surprised if tourists didn’t find this sign very helpful – aside from getting them many likes when they post it to Instagram. When you look at this stand, it doesn’t seem like much at first. 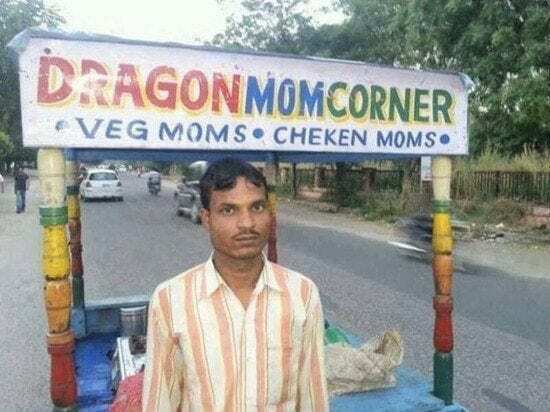 But this is actually a stand Daenerys Targaryen, Game of Thrones’ own Mother of Dragons, had opened up when passing by on her way to the throne. Well, not really. But wouldn’t it be cool if it were? We would venture a wild guess and say this stand sells hot dogs, both chicken and veggie. And the vendor seems very welcoming too. Everyone knows that while traveling, it’s a good idea to avoid certain foods that may cause stomach trouble. If the food doesn’t look fresh enough or the place seems unhygienic, you should probably steer clear of it. Still, sometimes we’re tempted to eat it anyway. But when a sign flat out tells you what the dish will cause, it’s a no brainer. We don’t think anyone who speaks English will be ordering this dish until this sign is replaced – even if they’re extremely adventurous. We can totally see the point of this sign. In fact, we were thinking about putting up some similar signs in many places we frequently visit in our day-to-day. 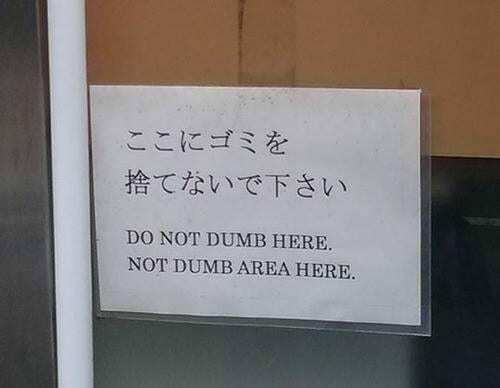 We think this sign might be on to something too; if there was a designated area where people could act dumb, without disturbing the rest of society, that would be great! While that’s a nice notion, we’re wondering what this sign was really meant to say before it was badly translated. Many people love getting tattoos. It’s not only a way to express yourself, but also a sign of courage you can brag about to your friends – or to people you’d like to date. 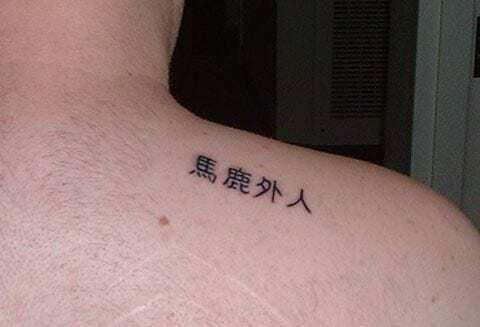 Getting a tattoo in Chinese or another foreign language can seem cool, but you might want to make sure it actually says what you think it means. This guy thought he was getting a tattoo that said God Almighty, but was harshly informed on Facebook that it actually means “stupid foreigner.” That’s not very nice, is it? Some people don’t like to eat their veggies. Have you ever tried to convince a child to eat his vegetables and finish them off the plate? It’s a real challenge. “Stupid brussels sprouts!” is a sentence many of us have uttered when we were kids. This restaurant recognizes the sentiment, and expresses it on the menu. 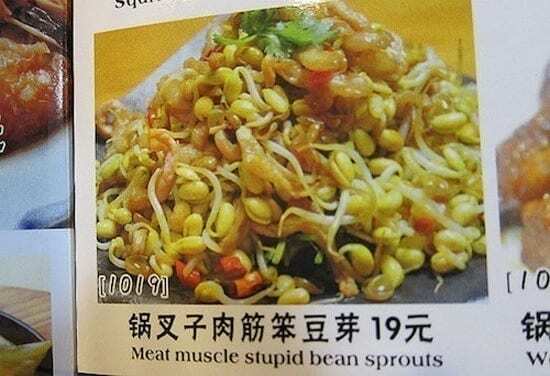 “Meat muscle with stupid bean sprouts” – because even though you may feel veggies are stupid, they’re good for your health! I Can’t Believe It’s Not Butter! came out in the early ’80s as a cheaper alternative to butter, and became a really popular product with great commercials. And in China, you can find copies for almost any product in the world – including this butter replacement. The translation is a little off, though, in a pretty hilarious way. 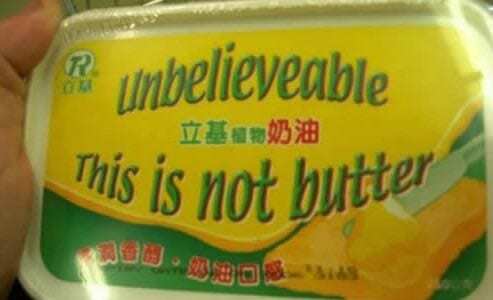 The famous phrase has been rephrased and now says, “Unbelievable, this is not butter,” which might sound like someone’s mad about it not being butter. 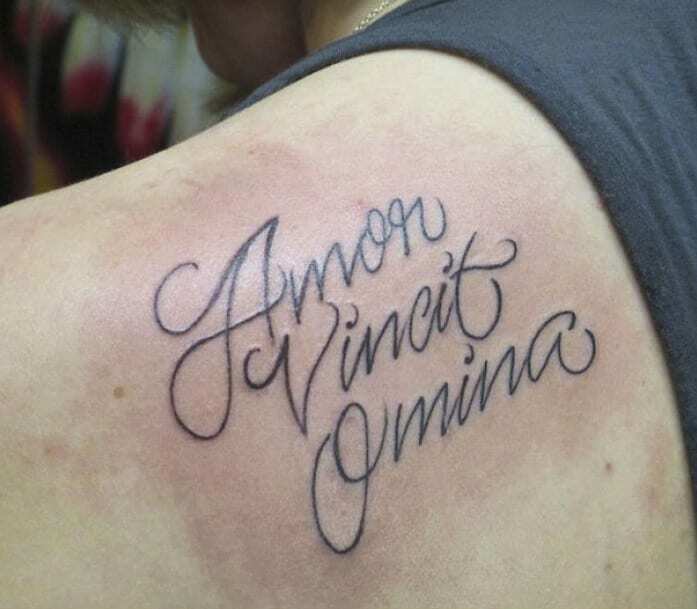 This girl wanted to get a tattoo that says “Amor Vincit Omnia,” a romantic expression that means “love conquers all” originating from the famous Roman poet Virgil. While it sounds lovely in theory, the tattoo actually ended up saying Omina instead of Omnia, so instead of saying “love conquers all,” it basically means “love conquers omens.” It’s funny how a simple mix-up between two letters can change the meaning of the whole sentence, but we’re not sure if this girl found it quite as amusing. This menu item made us stop in our tracks and wonder what these people are talking about. Did the chicken offend them in some way before they cooked it? Did it give them some attitude that justifies calling it “rude” and “unreasonable”? We’re seriously trying to imagine a situation where a chicken would behave unreasonably. 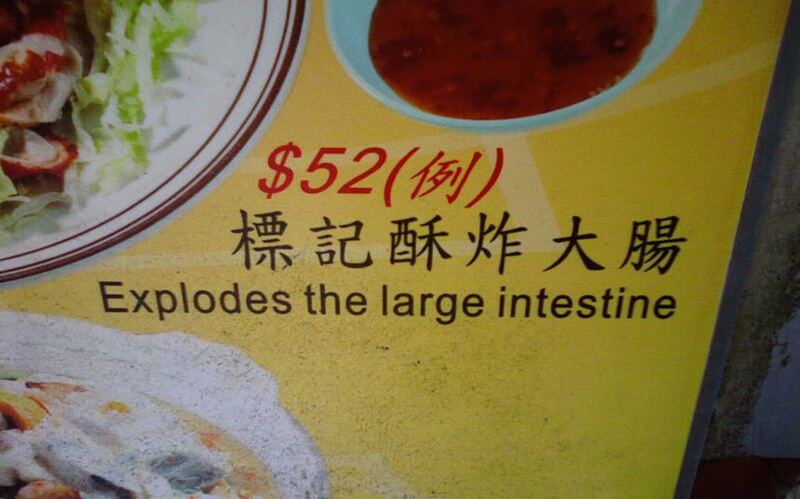 But it’s more likely that the person who wrote the menu was trying to translate a dish of jerk chicken, ending up with quite a literal description. One of the most important things when staying at a hotel, is the service. When the hotel’s staff is kind and welcoming, it just makes the whole experience much better. This hotel’s staff is particularly welcoming. If you’ve never gotten a warm and deliciously moist welcome at a hotel before, you really don’t know what you’re missing. And don’t forget to spread it thickly all over your day, either! That’s the most important part of all. When you’re in love, you do all sorts of crazy things. And getting your sweetheart’s name tattooed on yourself is something many people choose to do when they’re in a loving relationship. 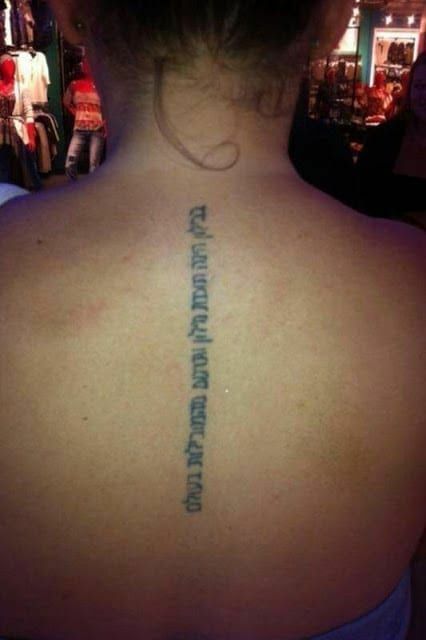 This girl wanted to tattoo “I love” and the name of her boyfriend in Hebrew, but the person who made the translation was sorely mistaken. Instead of using the translation of the sentence, they tattooed the slogan for the dictionary program they used. This actually says, “Babylon is one of the world’s leading dictionary and translation programs.” Ouch! The person who wrote this English menu is pretty hilarious. 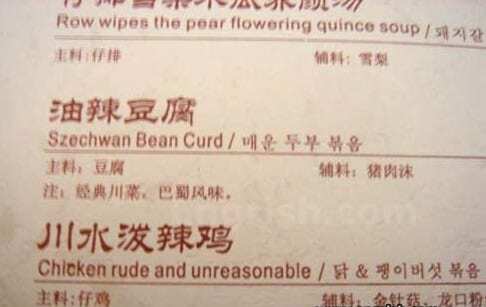 They translated the dishes from Chinese to English, but just couldn’t find the translation for one dish. 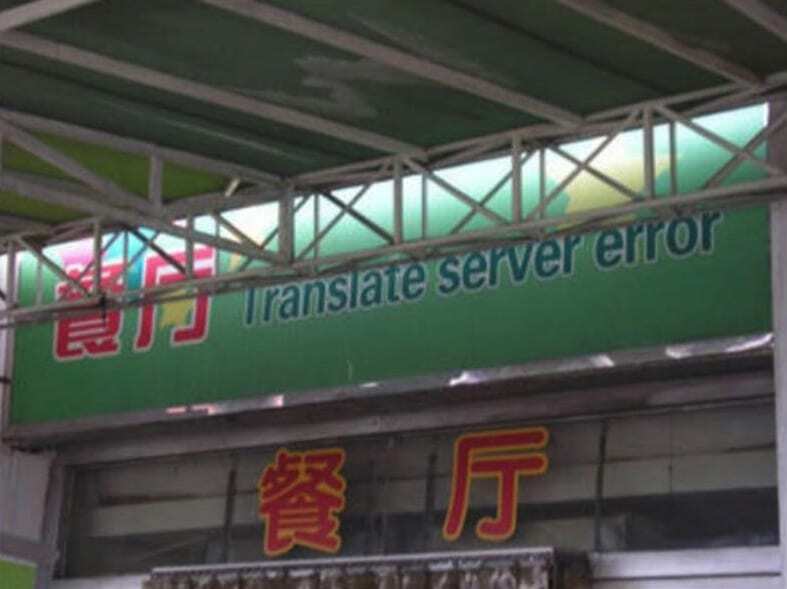 So they decided to go with transparency and tell the customers that while they couldn’t find the translation, they should really try this delicious dish. What’s even funnier, is that the items they did manage to translate don’t make much sense either. 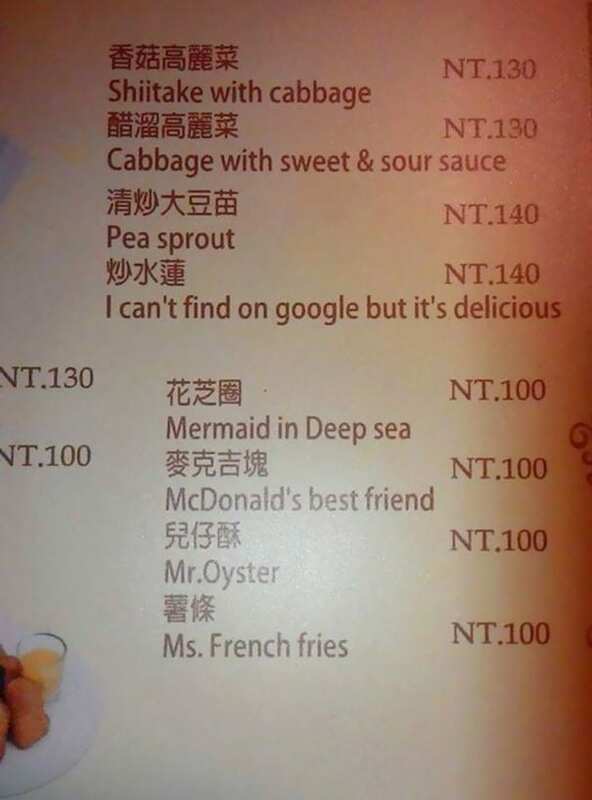 “Mermaid in deep sea” and “McDonald’s best friend” (is it Ronald McDonald?) sounds pretty strange to us. Many people love hamburgers, and some of them love hamburgers enough to wear a shirt that makes a statement about it. The popular dish is considered as comfort food, meaning it can make a person feel comforted just by eating it. 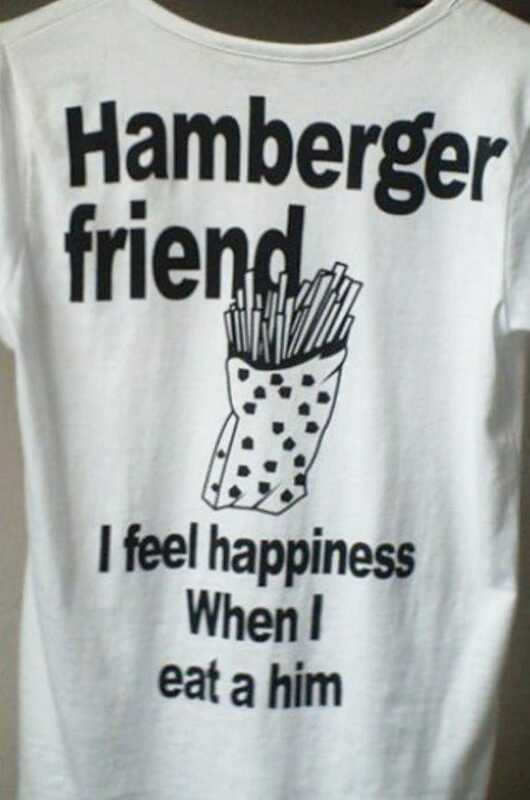 So we totally agree with the writing on this shirt – hamburger is a friend. But on the other hand, the text on this T-shirt is so badly translated, we feel comforted enough just by reading it. No hamburger needed! 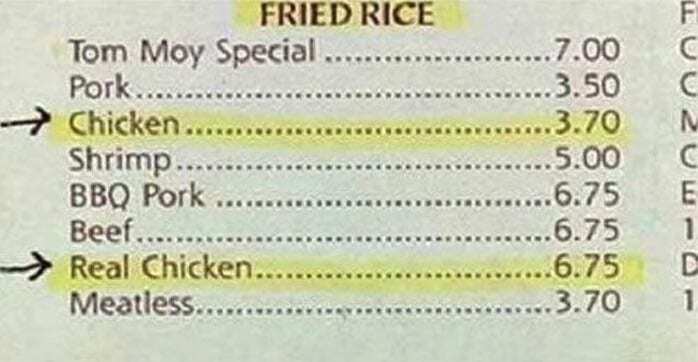 We don’t know how this person tried to translate their restaurant’s menu, but we have an inkling suspicion that something went wrong along the way there. 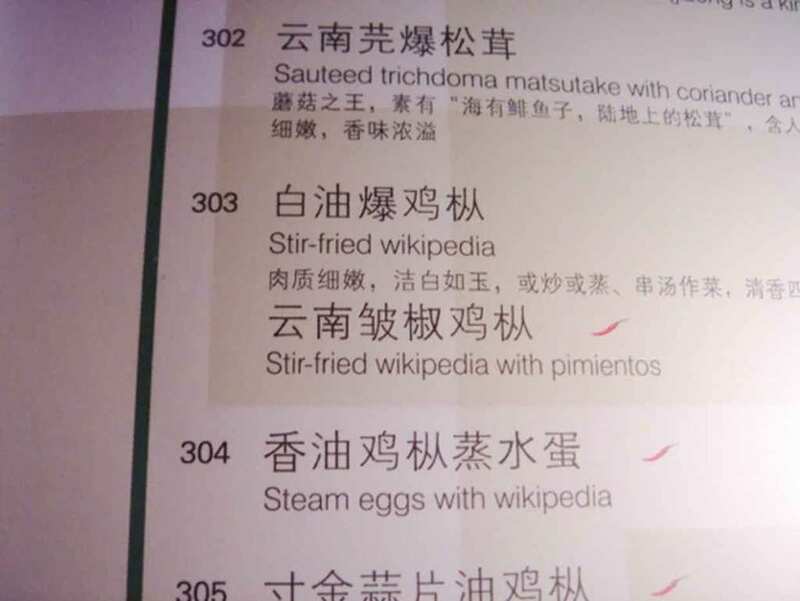 While “stir-fried Wikipedia” sounds like a potentially yummy dish – it is stir-fried, after all – we can’t say that we’ve ever heard of the dish. Nor have we ever heard of “Steam eggs with Wikipedia”. It can be a fun game, though – trying to guess which ingredient Wikipedia is supposed to be. When you travel different parts of the world, you might often find signs forbidding a certain activity, and warning you of the penalty you might expect if you don’t follow the rules. This sign explicitly says “No littering”, which makes perfect sense. Keeping a clean street is very important. However, it looks as though breaking this particular rule won’t involve consequences at all, because it also says “Violators will be fine”. 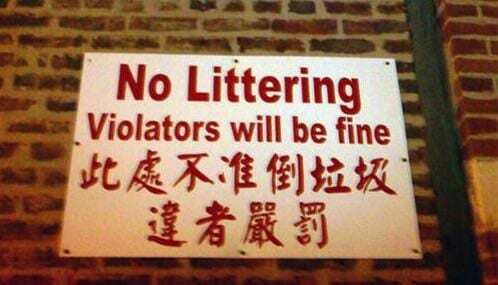 While we appreciate that reassurance, we think they might have meant to say violators will be fined. Unlike the sign that said violators will be fine, this one takes penalty to a whole other level. 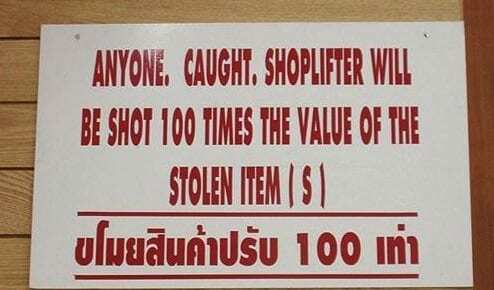 We’ve heard of the concept of shoplifters being charged a 100 times the value of the item they stole, but this sign sounds a little extreme. It seems like kind of a severe way to punish someone for shoplifting! This is a perfect example of how a minor error in translation can change the whole meaning of the sentence in a horrid way.